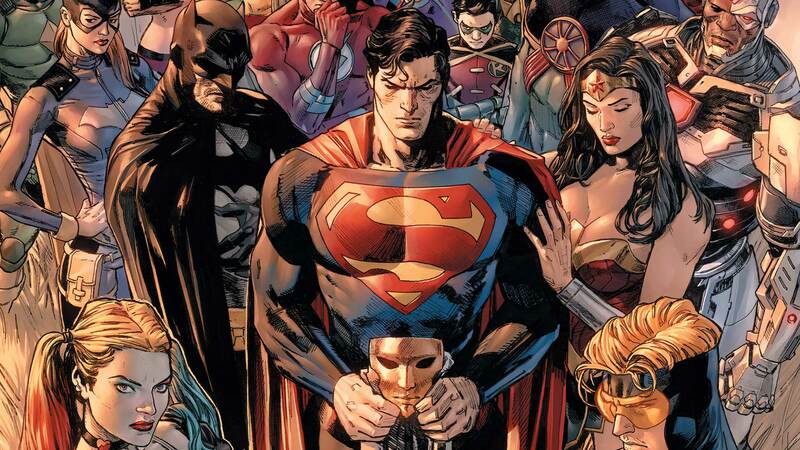 Now that Tom King and Clay Mann’s HEROES IN CRISIS #1 has finally landed, I want to take a second to talk about something that seems to bring out some pretty polarized opinions: death and superheroes. Or, more specifically, what death actually means in superhero comics. No, wait. Don't go running for the hills just yet. I promise it won't be that heavy, just a little complicated. Heroes in Crisis #1 kicks off with no short amount of death. Hopefully, that isn't too much of a spoiler right off the bat. We've known for a while that things were about to go very, very wrong at Sanctuary from the start and they do in spectacular fashion. The crux of the story isn't about a mental health institution for superheroes, it's a murder mystery—a murder mystery that revolves around a mental health institution for superheroes, sure, but a murder mystery nonetheless. Murder has happened, is what I'm trying to say. Characters have died. Now, if you talk about superhero comics long enough, the concept of death is going to come up. It's as inevitable as it is infamous. Whether or not you're a seasoned reader or a brand-new fan, chances are you've broached the topic at least once. These are stories that never end and characters that are functionally ageless, so things that are typically permanent in both the real world and other forms of fiction—things like death—don't necessarily apply in the ways we'd initially expect. Characters die and come back constantly. Sometimes they're gone for years, sometimes for months, sometimes just days—there aren't really a set of rules you can apply. Death just doesn't work for the cape and cowl crowd the way it does for real people because it can't, because superheroes don't get the luxury of having stories that permanently end. This can be a bug or a feature, depending on who you talk to. It's all pretty polarizing and there's no one viewpoint that's completely right and no one viewpoint that's completely wrong. We're playing an emotional ballgame here, not a logical one, and there is no correct way to feel. However, I'd like to posit something before we spiral into that debate. Rather than trying to parse out what does or doesn't make a death "matter" for a superhero, why don't we come at the whole concept from another angle entirely? What if the death itself shouldn't be considered the moment that really "counts" the most and instead, we started looking at the process—the act of the character dying and returning to life—as the thing that really carries the weight. The temptation is, always, for us as readers to see death in comic books and shrug it off—"it doesn't matter, they'll just be back later"—and while that might be true in the literal sense, it can never be that easy. Sure, death might not be forever, but the stories themselves are, right? Which means that each moment, however fleeting, really does count towards something. Superhero stories are less about the ultimate consequence and more about the process—the experience of the event rather than the outcome. Heroes in Crisis is a book that is going to mean a lot of different things to a lot of different people, and that's more than all right, but rather than trying to "solve" the problem of the deaths that happen by waving them off as inconsequential, or by clinging to them as if they're going to last forever, it may be more worthwhile to understand them as things that count right here, right now, in a way that sits somewhere between those two extremes. It may not be the easiest or the most concrete way to move forward, but conditional immortality has its cost, and stories like Heroes in Crisis that explore that cost from new angles really do matter, even if they're sometimes a bit of a challenge to work through. After all, working through complicated things is what Sanctuary was all about. HEROES IN CRISIS #1 by Tom King, Clay Mann and Tomeu Morey is now available in print and as a digital download. For more on the series, click here. Meg Downey covers Batman and the DC Universe at large for DCComics.com, and is a member of the #DCTV Couch Club. Follow her on Twitter at @rustypolished.